Double Zero @ IMAGINA VII Festival, Lima, Peru, Sept 19 — 22. Double Zero @ On Canal, NYC with Wallplay, July 31 — Oct 1. Double Zero @ Pioneer Works, NYC for DiMoDA 3.0, July 6 — 8. Double Zero @ VR Arles Festival, Arles France for DiMoDA 3.0, July 2—Sept 28. Double Zero @ Museum of Contemporary Art Chicago for DiMoDA 3.0, June 30. Double Zero @ 3LD NYC May 24—June 7. Artist talk @ National Sawdust NYC for DiMoDA 3.0, 6:30 pm. Double Zero Mobile a new interactive work @ ACTIVATAR through March. Eternal Fortune @ Gene Siskel Film Center for The Real-Fake, Chicago, Oct 19. Real-Fake.org 2.0 @ BronxArtSpace, NYC, Nov 19 — Dec 17. MacDowell Colony Fellowship, Peterborough, New Hampshire, Sept 29 — Nov 6. Tendered Currency @ Queens International curated by Hitomi Iwasaki & Lindsey Berfond, Queens Museum, NYC, Apr 10 — Jul 31. The End and The Beginning of Everything @ Columbus College of Art and Design curated by Michael Goodson, Nov 13 — Dec 11. Tendered Currency @ What Is Luxury? curated by Jana Scholze & Leanne Wierzba, Victoria & Albert Museum London, Apr 25 — Sept 27. Tendered Currency @ In __ We Trust: Art and Money curated by Tyler Cann, Columbus Museum of Art, Oct 3 — Mar 1. Eternal Fortune available on S[edition]. The New Romantics @ Eyebeam NYC, Apr 17—May 10. APPROACHING SYSTEMS panel @ New Media Caucus / CAA Chicago Feb 12. Friendly Fire in David Schwarz's Strangest Thing: An Introduction to Electronic Art. PostPictures @ bitforms NYC,Dec 19-Jan 25. Roadkill Diamond in Michael Petry's Nature Morte. awarded 2013 Greater Columbus Arts Council Visual Arts Fellowship. Science for sale on eBay until Sun, Apr 14. Magic Mansion Offline @ TRITRIANGLE. Cover story feature by Jeremy Ohmes for Events+Disruptions, Alumni Spotlight video interview by Yoni Goldstein. Tesoro-ee 1.0 live @ NO MEDIA, 8pm. Semi-Automatic featured by Sabin Bors @ Anti-Utopias. Tendered Currency @ New Capital, 24HRS/25DAYS, reception Dec 6, 7—10pm. De-Weaponized alongside Bridgette Bogle @ Inosculation, Urban Arts Space Oct 9—Dec 14. Reception Nov 3, 6—8pm. 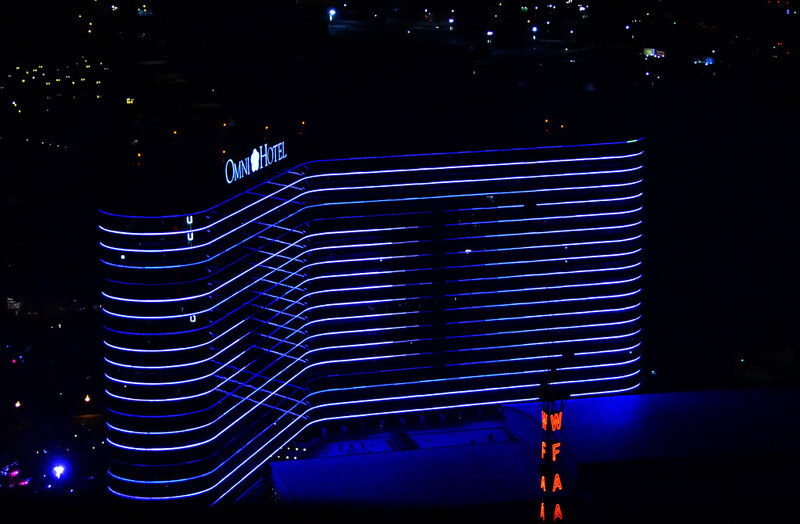 OMNEY @ Expanded Cinema on the Omni Hotel video façade for Dallas Video Fest 25, w/ audio simulcast on KXT Radio 91.7, 8pm. The End & Beginning of Everything— artist lecture @ The School of the Art Institute of Chicago, Neiman Center Sept 11, 4:15pm. Private Negations @ Sazmanab Project, Tehran, Iran, July 25: 7—8:30pm. Public Lighting @ 421 W State St, Columbus OH, May 25: 7—10pm. Tendered Currency, solo show @ The Reading Room, Dallas, April 14 — May 12. Halcyon Atmosphere @ Aurora, 7pm. CONFLUX, @ Pearl Conrad Art Gallery, Jan 19 — Mar 2. Art in the Age of High Security panel discussion @ Technology, Knowledge & Society Conference, UCLA, Jan 16. Memento Mori @ Hoxton Art Gallery, London. Sept 14 — Oct 6. Aurora, Dallas Arts District, Meyerson Symphony Center (East wall), sundown Friday, Oct 28. All that glitters, a very nice article on my diamond project by Lucinda Breeding in the Denton Record-Chronicle. Cost of Opportunity is a finalist for the 2011 Rhizome Commission grant. Slippage with Alfredo Salazar-Caro at 1111 Gallery in Dallas Saturday June 25 @ 8pm. Uninstalled @ R&D Gallery, Chicago, March 4 — March 11. Hairpin @ Bienal Fronteriza de Arte en el Centro Cultural Paso del Norte, por el Museo de Arte de Ciudad Juarez, Mexico. A recent writeup on the Gunpowder Diamond. Glitchenstein's Monster (right) @ CentralTrak Gallery's Glitch show until Feb 5 along with jonCates, Paul B. Davis, Kyle Kondas, LoVid, Tom Moody, Jenny Vogel and Matthieu Brooks, curated by John Pomara & Dean Terry. Congratulations to Adam Neese on winning Health in its entirety for $11.00! I am selling Health on eBay. Friendly Fire 4.0 will be at the El Paso Museum of Art's Border Art Biennial Nov 19 - Feb 13. De-Weaponized Time Signature / Bisecting Bruce Banner's Brain will be at the UNT Faculty and Staff Exhibition. Opening Reception Tuesday October 5th at 4:30pm. Semi-Automatic on exhibit at the East Gallery of Texas Woman's University Sept 21 to Oct 14, along with Jenny Vogel's Blue Book Series. Artist Talk: Tuesday August 17 @ 2:30pm at STEIM: the Studio for Electro-Instrumental Music in Amsterdam. The USA has sold to artist Jenny Vogel for $16.50. I am selling the USA on eBay. Resident Artist at STEIM: the studio for electro-instrumental music in Amsterdam June 21 — August 21.
live performance @ PIXELJAM, Apr 20, 9pm. My Second Life snapshots will be at Antena's Liminality show from April 2 through May 1, curated by Patrick Lichty. Identity has sold to artist Tracy Hicks for $15.48. I am selling Identity on eBay. The entire _____As Money series including this new live installment, Identity As Money, will be exhibited at the Ultra Xtra ArtsMix Friday. Presenting as a panelist for 3D Animation Pedagogy at the 2010 College Art Association Conference in Chicago. Friendly Fire in Game Show @ FATVillage Projects Ft Lauderdale, FL May 31—Jun 28. The End and The Beginning of Everything @ Herter Art Gallery, Amherst MA, Oct 19 — Nov16. Precipice of Unrecoverable 451 @ Paper-Thin.org. Tendered Currency @ Urban Arts Space Sept 28—Nov 14. Friendly Fire @ the Phoenix Art Museum. Greater Columbus Arts Council Exhibition @ Columbus Museum of Art, Jun 26—Sep 28. Residency @ Advanced Computing Center for the Arts and Design (ACCAD) Columbus OH, May 23 — June 6.
awarded 2013 Battelle Endowment for Technology & Human Affairs. Tendered Currency @ Mt Comfort Gallery, Indianapolis, Mar 7—Mar 30. Values Exchange Trading Floor @ Columbus Museum of Art, 1—4pm. Uninstalled @ R&D Gallery, Chicago, March 4 - March 11.